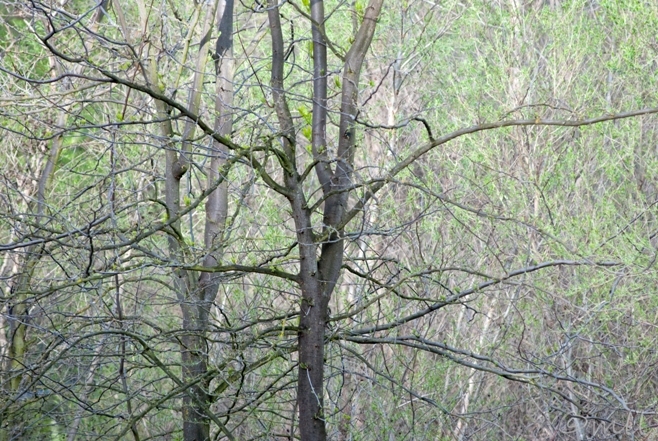 Another turkey from yesterday morning, down by New Hogan Dam. I would say I saw 50 turkeys, but that's probably an exaggeration. I wasn't actually counting anyway. 50 turkeys and 20 deer, that's my guess. 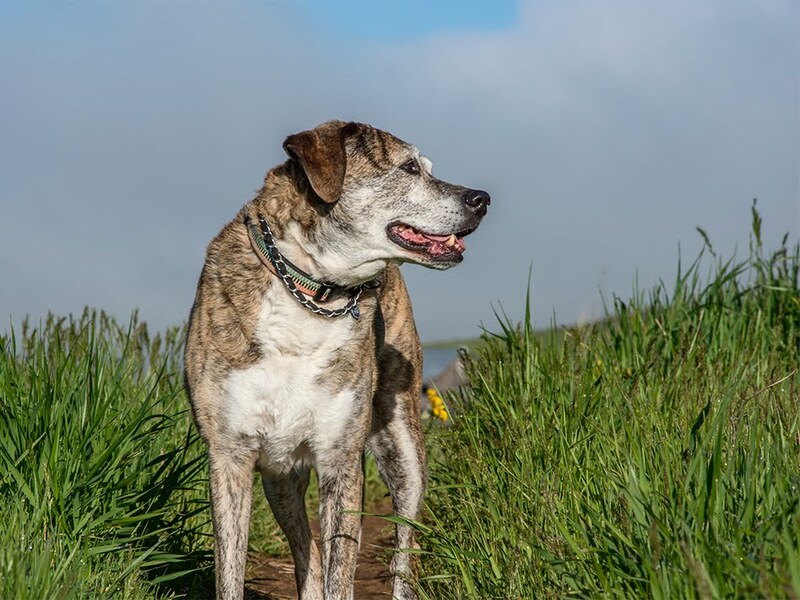 Clover was beside herself with joy. It turns out that she's not that interested in turkeys, but if we had seen the deer when she was out of the car, she would have taken after them like a shot. *She always comes right back, and she never catches them, but chasing deer is one of her greatest joys in life. You can hardly drive down any country road in March and not see a flock of turkeys running around. That was definitely the case this morning when I made this photo. The shot was actually a photo mistake. 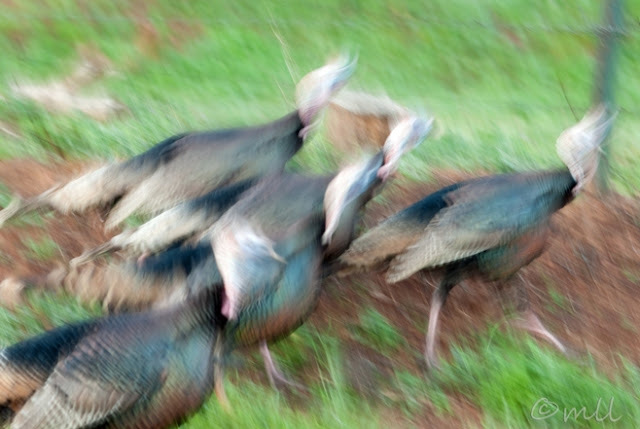 I had a slow shutter speed, and when the turkeys were running through the shot, I guess I gave up on it, and pulled the camera away in the opposite direction. I thought the result was interesting, maybe because of all the different colors on the turkeys. Or just the movement in general. 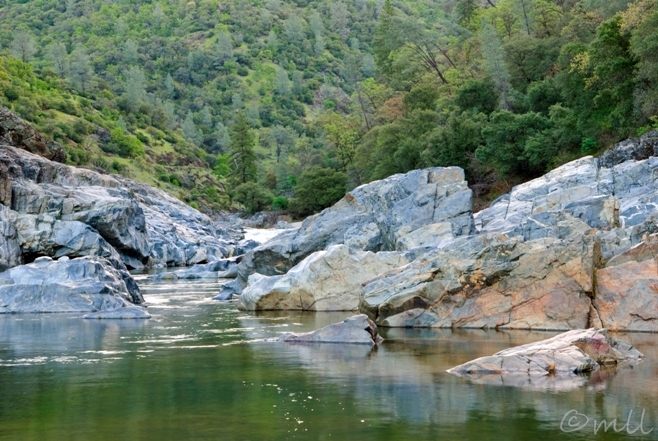 This is the last of my South Yuba River photos. I meant to post it yesterday, but I'm just incredibly busy with our annual spring break costume sewing for Sakuracon. Still sewing today but things will be back to normal tomorrow, and I plan to get out with my camera, hopefully for some more wildflower practice. 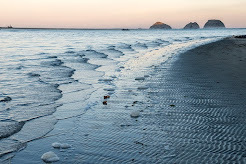 The thing I liked about this scene was the rusty orange section of rock in the right foreground. Same flower as yesterday and same location, but in a very different light. I have issues with both these photos. Flowers are so difficult for me to photograph. There's just so much to think about. 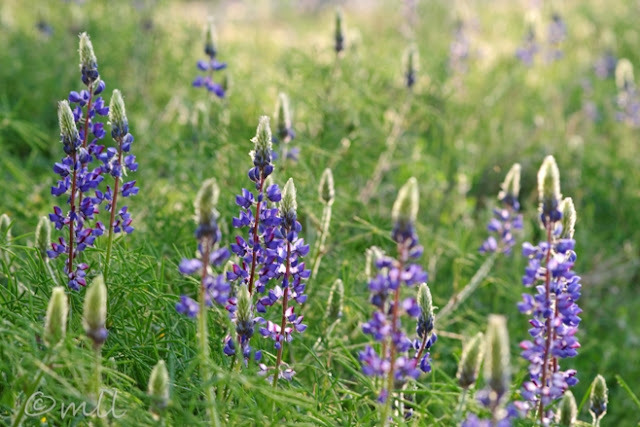 There's a lupine patch in town near campus. I'm going to practice on it this week. Also from South Yuba River State Park, but Lupine is growing all over the place right now. I've got one more version I'll post tomorrow. 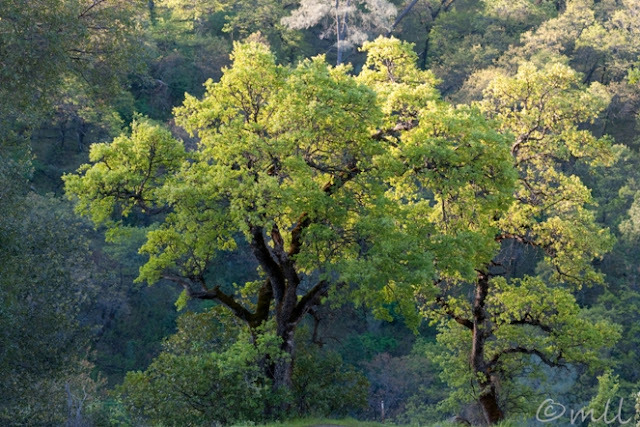 This is also from South Yuba River State Park. 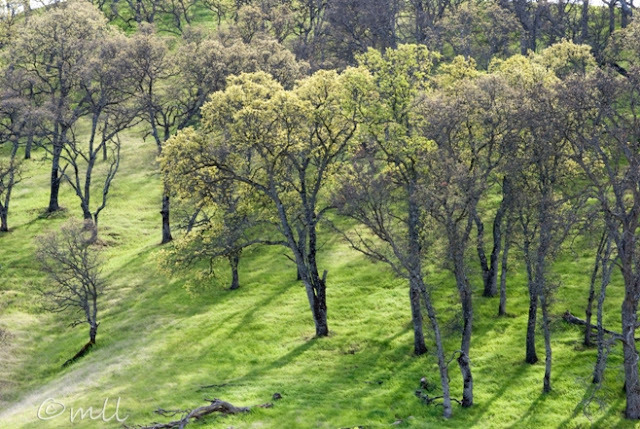 Before you enter the canyon, you're at a much higher elevation, full of pine trees, but as you descend into the canyon it becomes filled with these valley oaks. I was imagining a photo of these trees just as they were leafing out, but as you can see from this photo, I missed that event. Probably by a few week too. What inspired me to come here was an episode of Project Runway. I'm a huge fan, and in Thursday's show they did the Lord and Taylor spring challenge. I was so excited by Michelle's chartreuse version of spring, because I also associate that color with spring. Her dress was chartreuse and gray, which is perfect for the Pacific Northwest (Michelle is from Portland). They already wear that color so much there for visibility while exercising. And spring is so gray and green there anyway. We don't have much option for gray here. Maybe if there was a fog. (In my dreams this photo involves tender chartreuse leaf buds and a gray fog). I really missed getting the chartreuse shot I wanted in Napa a few weeks ago, and now again here. That means I have to wait for next year...photography is so hit or miss when it comes to weather and seasonal events. 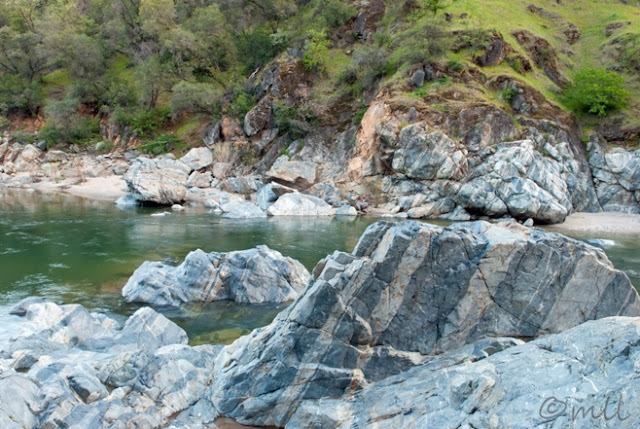 This is the lower stretch of the South Yuba River Canyon, right near where the covered bridge is. We had fun climbing on these chunks of granite this morning. This section had a neat stripe intrusion pattern going. Looking at it now I wish I had a slightly different angle, but I recall being sort of unstably perched up there, so I probably couldn't move any further to the left. I really don't know what came over me. I don't have an excuse for this. 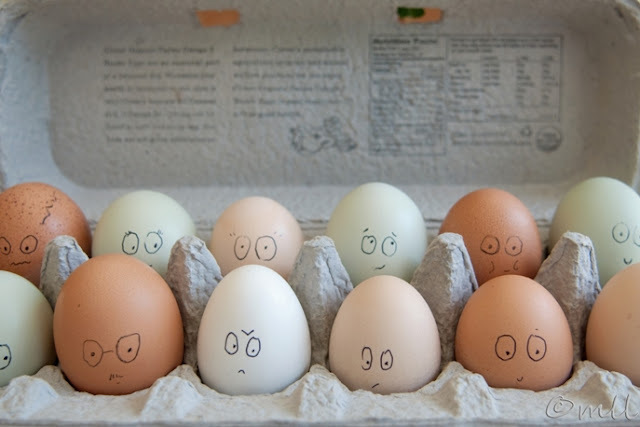 And now my son won't eat any hard boiled eggs because, as he told me, he has a rule about eating food with faces. The brain of spring, deep in thought in the early morning light. Whoever put this manhole cover back on, I salute you! This is WAY better than the lined up version. And I'm not just saying this because I'm a photographer either. Labels: manhole cover, midtown Sacramento, R St.
We've had a very dry winter here in the Central Valley, and since we don't get any rain in the summer we need a good amount of rainfall in the winter (and corresponding snow in the Sierras) to fill all the reservoirs for the summer months. Plus, I don't care where you live, some weather variety is just plain nice! In the extended forecast, we were supposed to be getting rain today, but as it's gotten nearer the forecast has changed, and this morning's forecast was for slight chance of rain, mostly cloudy. That seems to be how almost all the rain forecasts have gone this year. So far it still looks like rain tomorrow, and maybe, just maybe, this guy will need to have his bike seat covered today. Here's hoping! 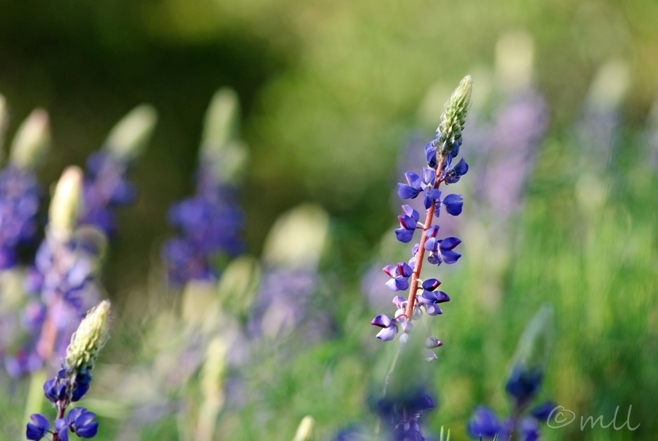 'Tis the season for blooming things around here. I don't know what this is called, but it's awfully pretty. What caught my eye though was actually the light. I like how the left branch is in the sun but the background is in the shade, and how the right branch is in the shade but the background is in the sun. ...and the California Poppies are just waking up. 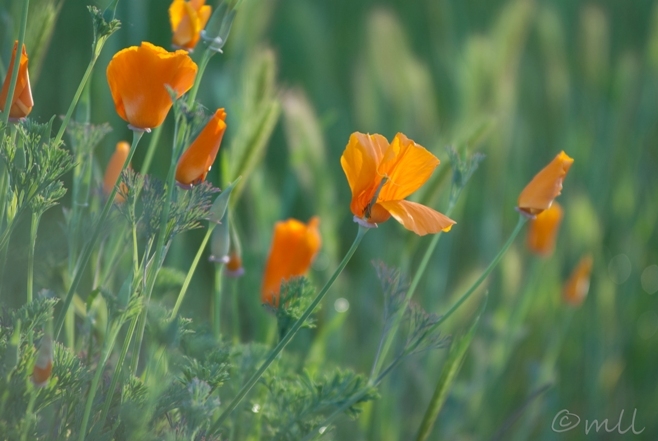 Here in California I always associate Golden Poppies with St. Patrick's Day, because they start blooming mid-March. And of course there's the green and orange, two of my favorite colors! This is definitely my favorite flower here in California. The state chose very wisely when it named the Golden Poppy the State Flower of California. 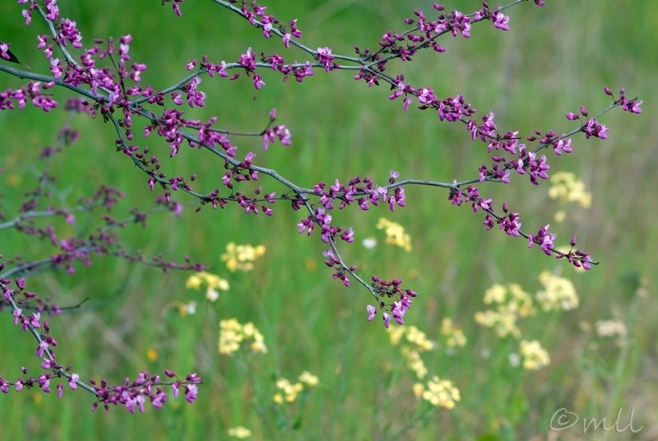 The state of the Redbud along West Davis Pond this morning. 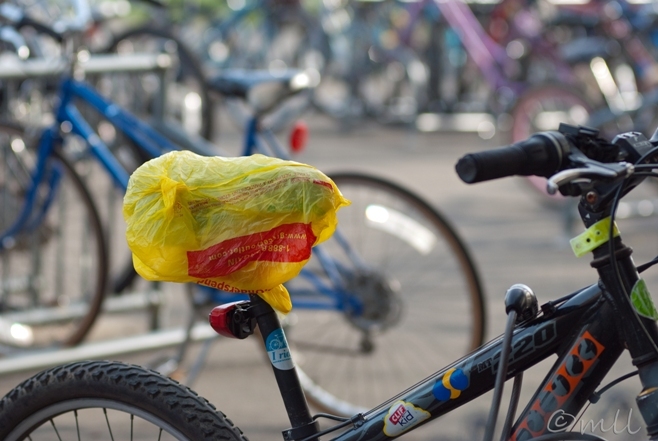 And the state of the blog the week: staying close to home. 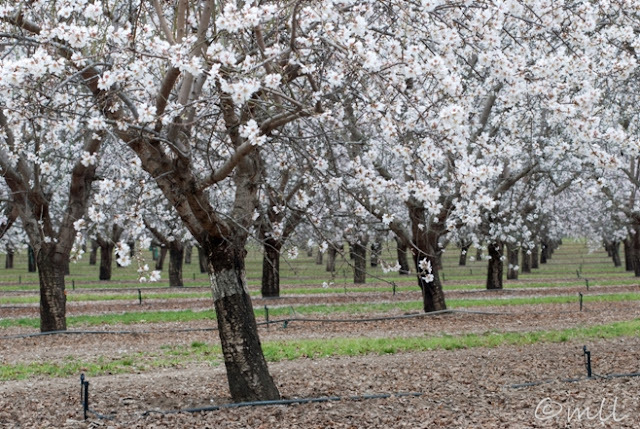 Up until today, all my almond blossom photos have been from one particular orchard in Capay that I deemed especially photogenic. 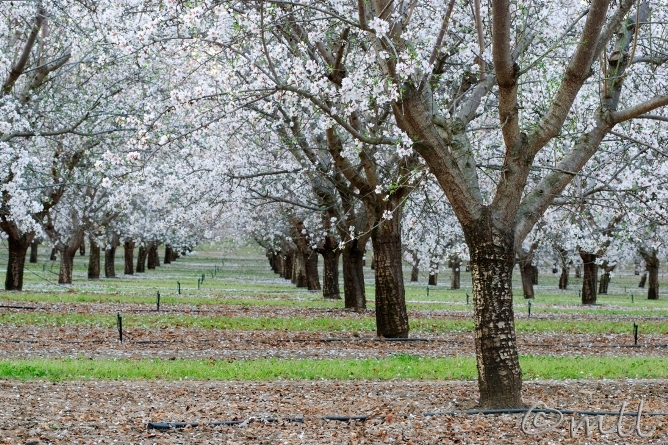 The orchard in today's photo is just a few miles away, right here in Davis. 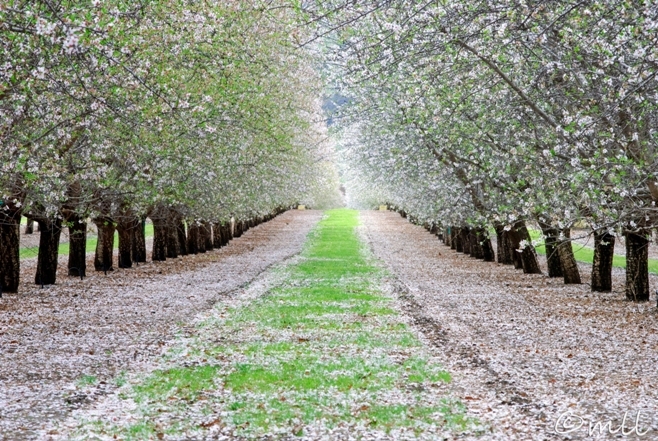 I've posted a blog photo of this orchard before on December 7, 2012. As you can see from both photos, this orchard configuration encourages leaves and petals to collect on the ground. I'm not sure why this is. 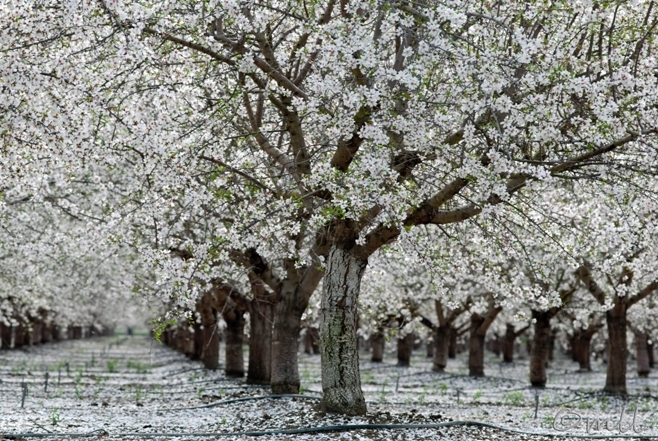 The orchard is unusual in that it's almost completely bare dirt underneath, so perhaps that's part of the reason. The other thing you can see from both photos is that we have a very short winter here! Today was my recon through Sonoma Valley, or as I learned today, Valley of the Moon. When I first saw this nickname I had to chuckle. I was imagining it came about in some New Age sit-in. 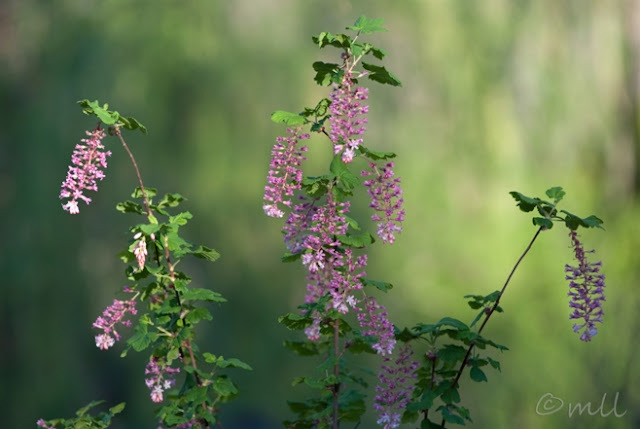 A quick web search suggests that the name is quite a bit older, dating back to the 1850s and likely coming from a Native American term for the valley. It turns out there's a book by Sonoma native Jack London called Valley of the Moon that makes this claim. I found this valley very interesting in comparison to Napa Valley. Sonoma has a much more "rolling hills dry California" feel to me, and Napa seems much more lush and more flat in the valley. Anyway, it was pretty, and a fun recon. I'm looking forward to getting back here soon, and hopefully in different light. Today and yesterday's photos are a set, taken at almost the same time and from almost the same location, but in opposite directions. I like them together for a couple of reasons. Combined, they show the width of Capay Valley, at least at this location which is just past the town of Capay. I also like them for their very different lighting. Yesterday's shot got the backlighting which gives it a lot of depth. Today's is lit from the front with the sun behind me, and looks so flat I can't get over it! It's got sort of a Grandma Moses feel. Anyway, I think it's charming, and those pink trees really make me happy. What kind of fruit tree are they, does anyone know? Spring has always been the underappreciated season for me, but living in California has changed that. Here I think spring is the best season. For one thing, it starts early, which I won't complain about! And it lasts a lot longer than in the Midwest. Also, the weather is perfect! 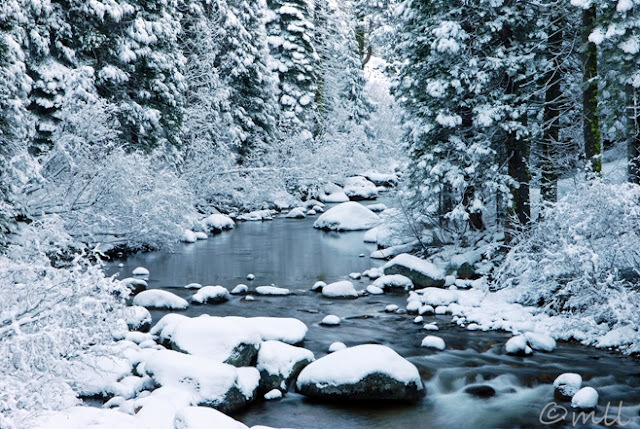 Today will be in the upper 60s and that's pretty typical for this time of year. By June we'll be baking in the 90s and these hills will be back to brown...and stay that way until the next spring. 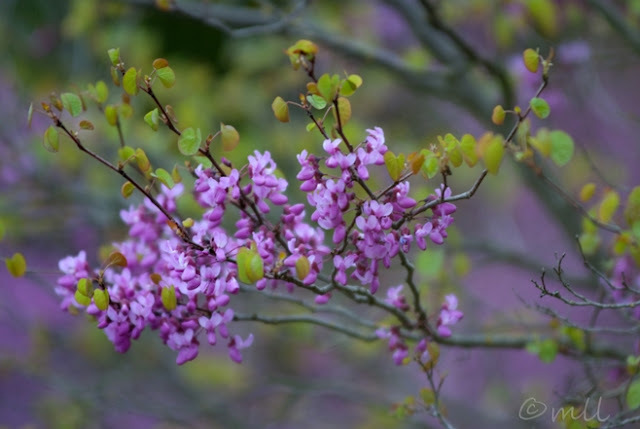 Now that I'm taking photos almost daily, I have my own definition of "Spring Fever." It's hard to keep from heading outside with my camera! I also tried photos that would look more like you were actually in the orchard. I had a lot of trouble figuring out where to place the trees though. Most people in my family liked the photos better when they contained a vanishing point, so I tried to work across rows but also give more of a "forest" feel. This one is probably my favorite, although I'm not completely sure about that. I've really lost the ability to see the forest from the trees, so to speak! Anyway I'm done driving out here; this photo was made last weekend. Yesterday we had an unusual weather system for around here, a cold front with a sunbreak. This sets up the potential for thunderstorms. We didn't get any though; we rarely do. But we got the cloud formations that come along with a thunderstorm. And of course I had to hurry out to the Capay Valley (between those hills in the distance) to see how it would look in this weather. For some reason I usually take the highway there and back roads home, but yesterday I took the back roads there instead. I'm always amazed at how the scene looks completely different coming from a different direction. I've never noticed this barn before. Of course having this weather system churning didn't hurt. 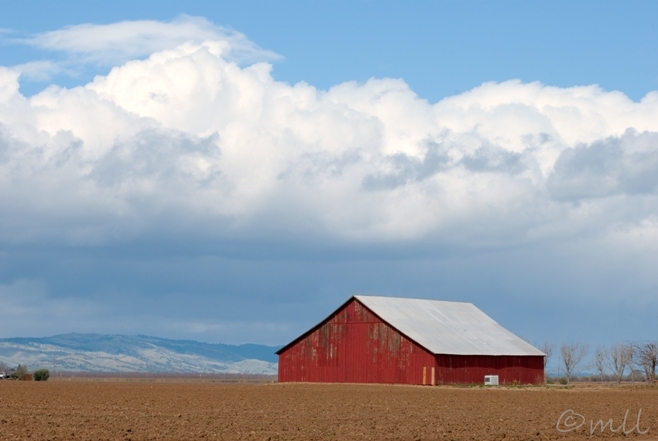 How could you not notice that barn with the big cumulus cloud overhead? The cloud is like Charlotte to the barn's Wilbur, skywriting "SOME BARN" for all to see! Pretty soon this obsession I have with the blossoming almond orchards will be OBE (My husband's Army acronym: Overcome By Events). The blossoms will be gone, and whatever it is I'm chasing after out here will be gone too. I saw this quote about inspiration being not about new work but about an obsession with an idea that has already been said, but not enough. That's sort of how I feel about these orchard photos. There's more to be said; the problem is that I keep searching for how to say it. 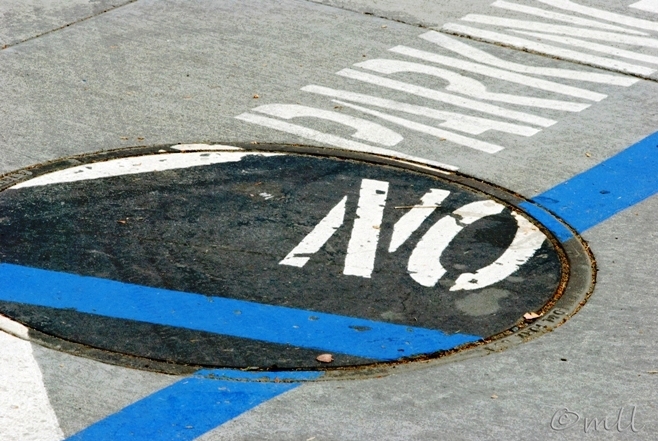 Anyway, this one is a variation on the February 28th photo. I just wondered how it would look with the ground covered too. 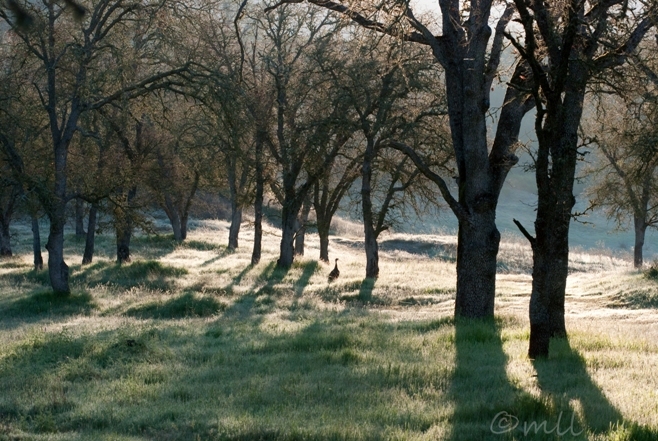 I have a few more orchard photos to post, but I'm going to alternate them with some other subject matter, for variety. and keeps me engaged with the ever-changing color palette. I have to admit, these photos are starting to cross my eyes; the possibilities seem endless to me right now, and I'm losing the ability to judge one from another. I feel like a person with an addiction who needs help! 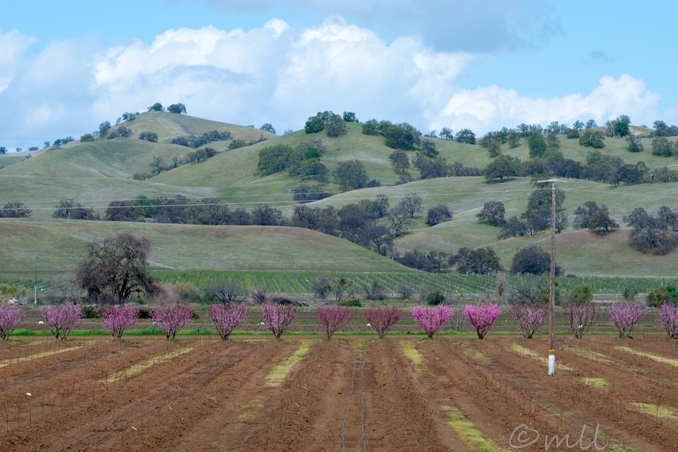 I want to head back to Capay one more time to get some photos when the blossoms start collecting on the ground. Probably tomorrow, since our car is in the shop today. I was doing a little research on California almond growing. California produces over 80% of the world's almonds, and accounts for 100% of US production. 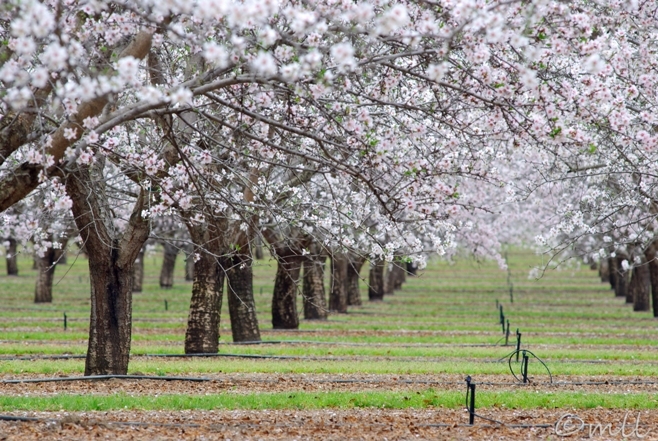 It turns out that the Capay Valley and Yolo County are not even close to the biggest producers of almonds; this really surprised me. 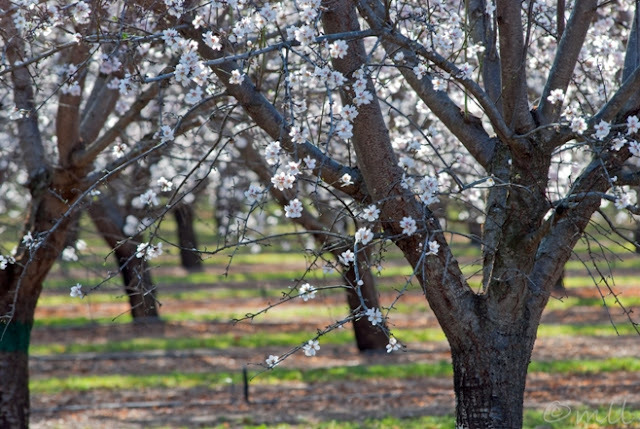 Capay Valley certainly embrace its role in almond production, with orchards extending for 30 miles up the valley. This year's festival was the 98th annual! A short intermission from Capay to show a different valley. 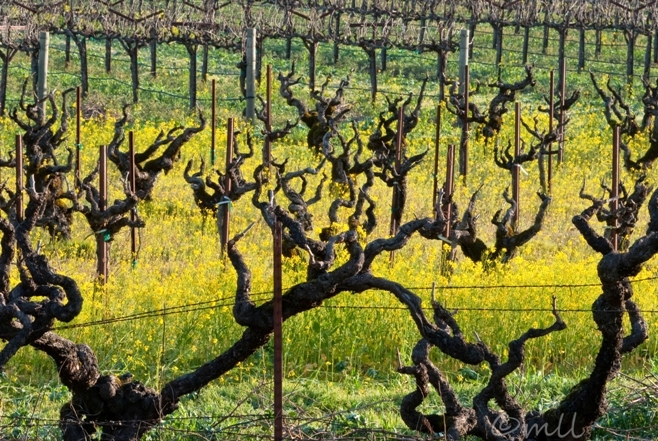 The mustard flowers are thinning in the Napa Valley vineyards this weekend, but I think the California poppies will be arriving soon! The outer row of trees in the almond orchards all seem to have their trunks painted; either with a ring of paint as in this photo, or with the trunk completely painted. I don't know the reason for this, but I'm guessing that the paint is enough to prevent some sort of pest from entering the orchard. The orchards are in peek bloom this weekend. It was somewhat overwhelming being out with my camera in all these blossoming orchards; the fragrance was so strong it made me lightheaded! This one is also from my drive through Capay yesterday; no new photos for today. It already feels a little repetitive to keep posting the same topic. 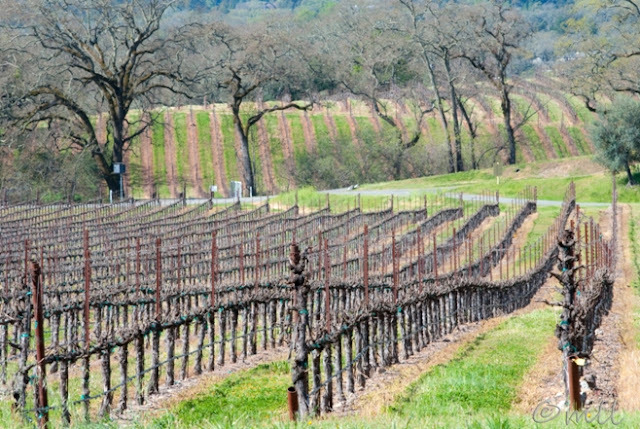 Between Napa and Capay Valleys I'll try to vary things a little. I'm just really wanting to explore these themes right now. I don't like this one quite as much as yesterday's photo. It does sort of remind me of prom dresses, but I've got to be looking at it upside down I think.